Reference number for this case: 5-Jun-54-Fougerolles. Thank you for including this reference number in any correspondence with me regarding this case. 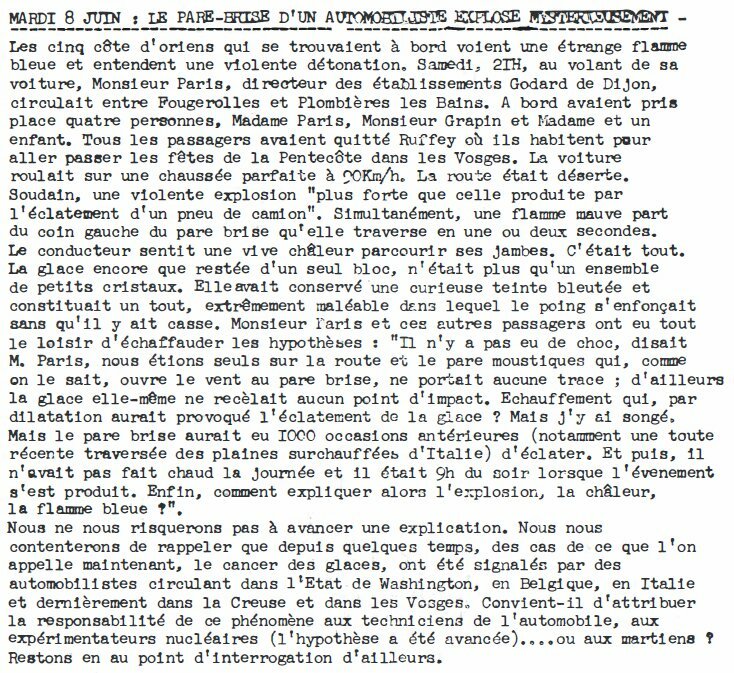 On Saturday, June 5, 1954, at 9 p.m., Mr. Paris, director of the Godard establishments in Dijon, drove his car between Fougerolles and Plombières-les-Bains. He had as passengers Mrs. Paris, Mr. and Mrs. Grapin and a child. They had all left Ruffey where they lived to spend the holidays of Pentecost in the Vosges. The car was traveling at 90 km/h on a perfect, and deserted, road. Suddenly, there was a violent explosion "stronger than that produced by the bursting of a truck tire", and simultaneously, a purple flame started from the left corner of the windshield that it crossed in one or two seconds. Mr. Paris felt a warmth running through his legs, and that was all. The windshield had remained in one piece, but was nothing more than a set of small crystals pieces. It had taken a curious bluish hue and was an extremely malleable whole in which the fist sank without breaking it. Mr. Paris and the other passengers had plenty of time to build hypotheses. Mr. Paris explained: "There was no shock, we were alone on the road and the mosquito shield which, as we know, opened the wind onto the windshield, did not carry any trace, besides the glass itself did not bear any impact mark. Heating that, by dilation, would have caused the bursting of the glass? But I thought about it! But the windshield would have had 1000 previous occasions (including a recent crossing of the overheated plains of Italy) to burst in. And then, it was not hot that day and it was 9 p.m. when the event occurred. Finally, how do you explain the explosion, the heat, the blue flame?" The newspaper did not try an explanation, but recalled that for some time, cases of what was now called "ice cancer" have been reported by motorists circulating in the state of Washington, in Belgium, in Italy and lately in the Creuse and in the Vosges departments of France. The newspaper wondered about the cause: the automobile technicians, or the nuclear experimentalists since the hypothesis had been advanced, or the Martians. The five residents of the Côte-d'Or who were on board saw a strange blue flame and heard a violent bang. Saturday, 9 p.m., driving his car, Mr. Paris, director of the Godard establishments of Dijon, circulated between Fougerolles and Plombières les Bains. On board four persons had taken place, Madame Paris, Monsieur Grapin, and Madame, and a child. All the passengers had left Ruffey where they live to spend the holidays of Pentecost in the Vosges. The car was driving on a perfect road at 90km/h. The road was deserted. Suddenly, a violent explosion "stronger than that produced by the bursting of a truck tire". Simultaneously, a purple flame starts from the left corner of the windshield that it crosses in one or two seconds. The driver felt a warmth running through his legs. That was all. The window, still only a single block, was no more than a group of little crystal pieces. It had retained a curious bluish hue and constituted a whole, extremely malleable in which the fist sank without the glass being broken. Mr. Paris and these other passengers had plenty of time to build up the hypotheses: "There was no shock, said Mr. Paris, we were alone on the road and the mosquito bug, which, as we know, opens the wind to the windscreen, did not carry any trace, besides the glass itself did not bear any point of impact. Heating that, by dilation would have caused the bursting of the glass? But I thought about it! The windshield would have had 1000 previous occasions (including a recent crossing of the overheated plains of Italy) to burst in. And then, it was not hot that day and it was 9 p.m. when the event took place. Finally, how do you explain the explosion, the heat, the blue flame?" We will not risk an explanation. We will simply recall that for some time, cases of what is now called ice cancer, have been reported by motorists circulating in the state of Washington, Belgium, Italy and recently in the Creuse and in the Vosges. Is it appropriate to attribute the responsibility of this phenomenon to the automobile technicians, to the nuclear experimentalists (the hypothesis has been put forth)... or to the Martians? Let's leave this with a question mark. The windshield damage epidemic in 1954, called "window cancer" - or "parebrisite" in France - has become an often-quoted example of "collective illusion" or "mass hysteria". Sociologists and psychologists refer to these 1954 incidents in France, in the United States, to ensure that "crowds" can easily fall for unfounded myths. And of course, some "skeptical" ufologists explain that the "windshield cancer " that preceded the "flying saucers" epidemic of 1954 proves that the saucers too are only illusions. None put forward the following point: "mass hysteria" here would in any case only apply to the interpretation of the facts, not to the facts themselves. And the interpretations were not really "hysterical", they were attempts at rationalization quite understandable and sensible in the context of the time. All sorts of explanations were advanced at the time for "window cancer", such as those noted in the newspaper here, or that of "vandals". In the United States, the police found that the epidemic affected mainly old cars, and it was thought that the windows would explode because of ageing. But is it so simple? In this case, should we not listen to Mr. Paris: "how to explain, then, the explosion, the heat, the blue flame?" Where did this flame come from? Martians do not exist, and the incident probably has nothing to do with any extraterrestrials. One could then think of a thunderclap or ball lightning, but those does not break windshieds, and it is unlikely that Mr. Paris would have not noticed or not mentioned a thunderstorm or lightning. I know of 2 more cases of windhsield explosions in the Côte-d'Or later in 1954 from the same newspaper. I do not include those in this catalogue because they have absolutely no strangeness (no flame, etc.) and were not associated in any manner with UFOs. [---] Article in the regional newspaper Le Bien Public, Dijon, France, June 8, 1954. [vi1] "Catalogue, in the ufology bulletin Vimana 21, A.D.R.U.P., ufology group, France, #0-11, page 10, 3rd quarter 1982.